Web analytic firm Flurry claims it has proof an Apple tablet is in the works. Based on Internet traffic analysis from third-party software developers, Flurry says Apple's Cupertino campus has been testing hundreds of mobile of apps on what it believes are 50 prototype Apple tablets. 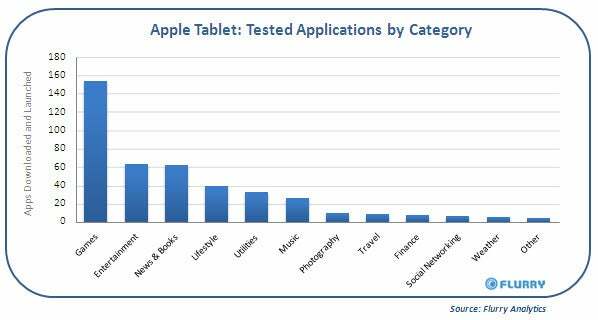 Flurry says that testers of the early iterations of Apple's tablet have downloaded around 200 apps from clients that use its traffic analytic software. By tracking where download are originating from Flurry says it identified dozens of tablet-like devices that did not leave the Apple campus and run a yet to be released operating system (version 3.2). The current iPhones and iPod touch devices run on the 3.1.2 version of the OS, so this could indicate that a rumor that the Apple tablet will be a giant iPod Touch, rather than running on a different OS. However, Flurry also explained that it has noticed iPhones running 4.0 software in the wild, pointing out the device running on the 3.2 version software is a different one. The Flurry report studied what sort of apps were downloaded on the so-called Apple tablet and says that the use for the device will be user-oriented, with a limited business applications. According to the report, games were the most downloaded category by the testers, followed by entertainment, news, books, and music (click table to enlarge). "We can surmise that the device will be thin and light, designed for portability," Flurry claims. However, the analytics firm does not detail on the characteristics of the tablet, invoking confidentiality agreements with its customers. The most interesting clue from the Flurry report is the OS version the Apple tablet is running (3.2), which doesn't particularly match with the recent speculation that the tablet will run on a more powerful OS that would allow multitasking. As for the iPhone 4.0 software, we might not see it live until this summer, when a new iPhone is expected. Apple has announced an event on January 27 with the "Come see our latest creation" tag line, where Steve Jobs, who is reportedly excited about the launch, is expected to unveil a tablet device.